5. The reservation fee is the only payment required at this time, an Order and Purchase Agreement with estimated system cost and delivery schedule will follow upon receipt of your reservation. Each iRIS analyzer is shipped with the software to integrate PEM’s online 14C reference certification system. The SI-14C is the industry’s only SI traceable standard for 14CO2. The iRIS operation with “gas-free” reference specifications is capable of measuring radiocarbon on an absolute scale, and thus potentially capable of replacing the current artifact-based scale with one that is entirely SI-traceable (Fleisher et al. 2017). All of the online SI-14C Reference System data are protected with banking-level encryption to ensure privacy and data integrity to end-users. This component transfers pure CO2 gas from a peripheral to the iRIS. The iUGI-001 provides a continuous flow interface for the iRIS 14CO2 applications. The iUGI-001 integrates all external and peripheral devices (e.g., analyzers, concentrators). The iUGI-001 is uniquely positioned to leverage the high-precision and low cost of ownership features of PEM’s iRIS-III into applications spanning industries. With this configuration, your project can directly trap CO2 from ambient air or from a gas stream, such as a flue, or other sources piped directly to the analyzer. With this configuration, your process and compliance requirements can be met by linking an automated flue gas sampling system with the iRIS providing the first automated package for biofuel blending and waste-to-energy operations. The system is designed to operate in proximity to the stack for direct sampling of the flue gas as well as from other gas source locations. A precision for blended fuels or source composition for waste-to-energy facilities is expected to be < 1% Fraction Modern (See FAQ and Specification Sheet for additional information). The data rate is ~ 45″ per hour or ~32 samples per day. In conjunction with the SI-14C reference system, each sample analyzed will bear a time-stamped verification certificate reporting the SI-14C parameters. In cases where networks of analyzers are deployed across local, regional or global facilities, the PEM System of SystemsTM provides automated reporting and alarm settings for all analyzers in the network. All networks can be linked and remotely probed for process conditions. The flue gas analyzer (e.g., Amatek Advanced Flue Gas Sampling System) is also controlled by software integrated with the iRIS. 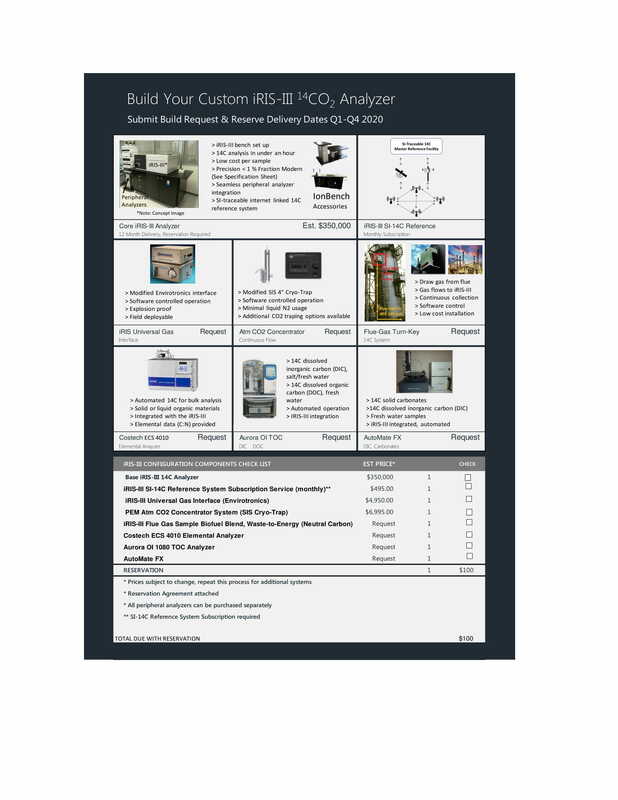 With this configuration, your lab can link a Costech ECS 4010 Elemental Analyzer with the PEM iRIS 14CO2 analyzer for automated D14C measurements of bulk samples. With this configuration, your lab can link a total organic carbon (TOC) gas preparation system manufactured by OI with the PEM iRIS 14CO2 analyzer for automated analysis. The integrated system provides 14C measurements of the dissolved carbon in water samples for analysis of the total organic carbon (TOC), total inorganic carbon (TIC), and non-purgeable organic carbon (NPOC) content. USEPA-approved methods, Standard Methods, ASTM, DIN/ISO/CEN, and EU Methods are employed. The 1080 can analyze up to 300 samples per 24-hour period, depending upon the protocol employed, in excess of 100,000 samples per year. The system is fully automated for the measurement of 88 samples. With this configuration your lab can link an Automate FX sample preparation device with the PEM iRIS 14CO2 analyzer for automated D14C measurements of the dissolved inorganic carbon in water samples or D14C in solid carbonate samples. The system is fully automated for the measurement of 45 samples.